When James M. Ashley was two years old, his family moved to Portsmouth, Ohio where his father operated small bookbinding and soap and candle-making businesses, in addition to serving as an ordained minister. James M. Ashley left home as a teenager to work as a riverboat cabin boy. In 1848, James M. Ashley founded the Portsmouth Democrat, but the publication quickly failed. James M. Ashley was admitted to the Ohio bar in 1849, but he rarely if ever practiced law. While living in Portsmouth, Ohio. James M. Ashley was actively involved in the Underground Railroad. In 1851, James M. Ashley married Emma J. Smith of Kentucky and moved to Toledo where he opened a drug store. In 1856, James M. Ashley was selected as a delegate to the national convention of the newly emerging Republican Party. In 1858 and 1860, voters of Ohio’s Fifth Congressional District elected James M. Ashley to represent them in Congress. In 1862, 1864, and 1866, voters of Ohio’s Tenth Congressional District elected James M. Ashley to represent them in Congress. James M. Ashley represented Ohio in the thirty-sixth through fortieth Congresses from 1859 through 1869. During his tenure in Congress, James M. Ashley aligned himself politically with the radical element of the Republican Party, especially on the issue of abolition. In 1863, James M. Ashley introduced the first proposal during the Civil War for a constitutional amendment to abolish slavery in the United States. In January 1867, James M. Ashley introduced a motion in the U.S. House of Representatives floor to impeach the President Andrew Johnson. The motion eventually failed. 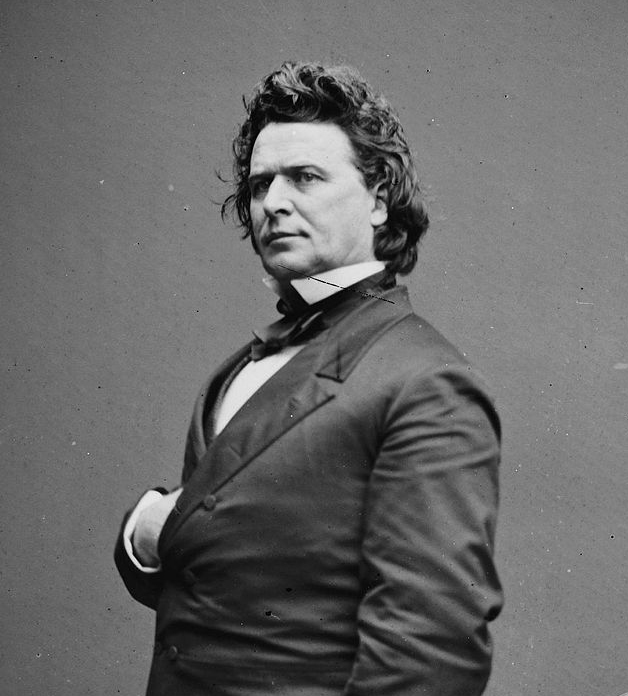 Three months later, on February 24, 1868, James M. Ashley voted with the House majority in favor of impeaching President Andrew Johnson. In 1868, voters from Ohio’s Tenth Congressional District voters elected Democrat Truman H. Hoag to replace James M. Ashley in Congress. In 1869, President Ulysses Grant appointed James M. Ashley as Governor of Montana Territory. Ashley assumed his new office on April 9, 1869. President Grant summarily sacked James M. Ashley as Governor of Montana Territory without comment in December 1869. In 1872, James M. Ashley served as a delegate to the Liberal Republican Party’s national convention in Cincinnati. When the Liberal Republican Party dissolved after President Grant’s reelection, James M. Ashley switched his political allegiance to the Democratic Party. In 1875, James M. Ashley moved to Ann Arbor, Michigan and immersed himself in the railroad business. James M. Ashley served as president of the reconfigured Toledo, Ann Arbor and Northern Michigan Railroad until the company went into receivership during the Panic of 1893. During the 1890s James M. Ashley returned to the Republican Party and made two unsuccessful attempts to return to Congress. A victim of acute diabetes, James M. Ashley suffered a fatal heart attack on September 16, 1896 in Alma, Michigan.